Here are some of my favorite tweaks in Windows, the list has manual methods & an archive of registry hacks on all tweaks mentioned can be found at the end for download. My Computer –> Tools –> View –> Check ‘Restore Previous Folder Windows At Logon’ option. To make copying & moving of files a lot easier rather than having to select, cut/copy, use this trick to open the explorer browser to directly move or copy files to a location. 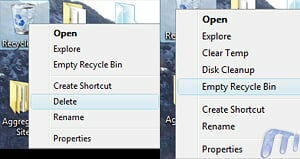 I prefer not to have the delete option for recycle bin on the desktop, use the registry trick to obtain the same. You can customize the behavior or uncheck the ‘Use Autoplay for…’ to completely disable it. You can also refer to this article regarding UAC tips.